Tomb of Cecilia Metella (1st century BC), Via Appia, Rome, ca. 1857. Photo by James Anderson (1813-1877). Collection of the Sack Photographic Trust, San Francisco Museum of Modern Art. The tomb is located about 5 km outside Rome. The mausoleum is a striking landmark for the traveler who comes to Rome from the south. The tomb was erected for Cecilia Metella, daughter of Quintus Caecilius Metellus Creticus (consul in 69 BC), and wife of Marcus Licinius Crassus (the son of the famous Crassus). The sarcophagus of Cecilia Metella is now in the Palazzo Farnese. The round shape of the tomb is inspired by the Etruscan burial mounds. 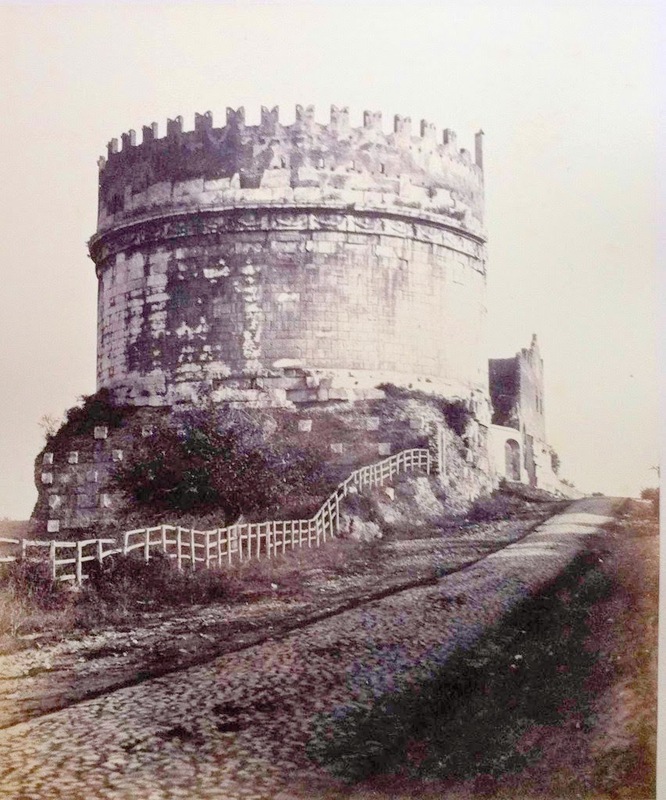 In the Middle Ages the tomb was the main tower of a fortress that controlled the southern access road to Rome. The construction started in the 11th century, and in 1302 the battlements were added to the top of the tomb. Cecilia is one of those Roman names which became very famous and was exported (and used) all over the world. However I'd never give such a name to my daughter, because its meaning is "blind". Likewise, I find also not nice "Claudia" (cripple) and "Paula" (small in stature). That’s certainly imposing; she must have been quite a woman!